Homespun Stitchworks..... For the love of vintage: The 'Stitch in time exhibit' at the Victoria and Albert Museum. The 'Stitch in time exhibit' at the Victoria and Albert Museum. of our wonderful capital and in the heart of fashionable Kensington. Well as you all know I went to London last Friday and I was there for a few reasons, one being the 'stitch in time exhibit'. Now I have to say I thought it would be a large exhibit but in fact it is only one glass case. Now do not get me wrong there are some lovely sewing bits inside said case and some great information, which I will share with you .... But I was a little disappointed that there was not more in the way of stitchery bits. The V&A has so much to see though that you can still immerse yourself in there for hours at a time and they had some great exhibitions on the go. One being fashion and the other was shoes! The shoes exhibit you had to pay for and I would have but no photography was allowed so I could not share it with you all ... thus I decided not to go in. The Victoria and Albert museum was opened in 1899 and is such a beautiful building in its own right with the original floors and tiles in the toilets and stain glass windows lovingly cared for and that are original. It is such a pleasure to walk through those iconic doors. The Rotunda Chandelier that hangs there is not only for light but a visual delight. 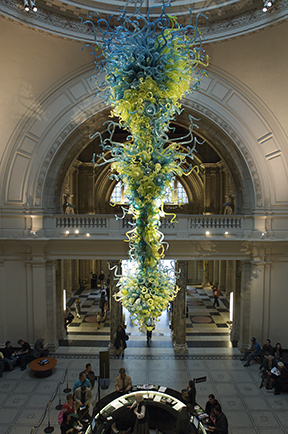 It is a glass sculpture by Dale Chihuly and hangs under the glass rotunda in the entrance of the V & A. It was installed in 1999 and then substantially altered and enlarged to its current size in 2001. If you are reading this from abroad and have never been to London and to the Victoria and Albert museum, then please if you ever get the chance to go and see it you will be thrilled I can promise you that. Well I went off to find the exhibit of stitching bits from the 1900's and there it was. I have taken a photo of everything in the case for you and written down all the information for you as well. designed to hold fabric to the edge of a table. On the top is a pin cushion and a hook, which was possibly for holding spare thread. The second piece is again a work holder (bottom left of picture) of cut steel and velvet and dated around C1807 -20. Cut steel tools where costly and high status possessions. Some were decorated with faceted studs to catch the light like gemstones and were durable as well as attractive. George Palmer was the maker of this particular holder and also made razors and he was a cutler. He also made penknives and scissors. On the top right of photo is a cotton winder of cut steel and is believed to be around C1800 -20 in age. Sewing then was not only a private craft but also a social one and like the work holders this would also have been an expensive and stylish, which would have no doubt been displayed by the person sewing very proudly when working in front of family or friends. It was designed for easy winding of cottons on to the rotating bobbin which is attached to the clamp that holds it securely to a table. Then there were a few thimbles and the V & A stated that decorated thimbles had been produced since at least the 1500's, which astounded me. They were often given to women as sentimental gifts as they symbolised female industriousness and virtue!! C1840 -50. These particular needles were designed for knitting delicate lace, and were stored safely in the embroidered case. The blue effect on the needles was produced by heating the steel at high temperatures and allowed the knitter to mark the length of of her row of stitches. The elaborate case suggests that these needles were a prized possession and were taken very good care of. There were a beautiful pair of scissors (top right of picture) of cut steel and they have initials of A.M C1700 and were probably Abner Morton a scissor maker of the time. The beautiful scissor were both decorative and functional and were used for fabric cutting. When the scroll work handle is closed to birds appear as their beaks meet. The blades resemble obelisk supported by two dogs standing either side of an urn. This design takes many of its elements from heraldry. Along side these were these shears with a case C1600. Shears were also made to cut through fabric. They are both gilded and inlaid with mother of pearl. They would have been part of a brides trousseau or collection of household goods, gathered in preparation of a marriage. Such expensive and attractive shears would have symbolised the high status of the bride and her family. Then there was a tray of these beautiful buttons made of cut steel C1840 -50. At this time is was seen that an accomplished seamstress to have the ability to embellish clothes to reflect modern fashions and showed of her skills as a needle woman. This could be achieved by adding or changing the trimmings. sewing kit demonstrates how sewing tools could follow the fashion of the day. Produced at the height of Art Nouveau period, both the heart shape and bright green colour were popular characteristics of this style. The shape of this sewing kit suggests sentimental and romantic associations and was possibly a gift from a loved one. Look at the bone handled tools in the case. This would have been a very expensive gift in its day. The next piece is a sewing manual of paper and with textile inserts 1838. The National Society for Promoting the Education of the Poor published this manual in 1838 y to instruct charity schoolgirls in basic needlework and knitting skills. The book would have been used been used by a teacher, rather than the pupils themselves. Poor women and girls were expected to support themselves through sewing, often for very long hours and very poor wages. These stitchery items were beautiful under the lights and proudly put in a glass case. It was a little tricky to take photos but I hope that I managed fairly well for you all to look at. They have these massive balls of twinkling lights on this very impressive ceiling and the stain glass windows are stunning. One of the things I learnt about the restaurant and cafe is that originally it had different first and second class menus, and a third class service for 'mechanics and all workmen employed at the Museum Buildings and even for the humble working class visitors'. in its day.. so my guess was I was sitting in the first class section!!! They have a great gift and book shop inside the V & A and I wandered happily around for several hours. I hope that you have enjoyed this little tour and tomorrow although I do not do a blog I will be announcing the winner of the competition so please come back and see if it is you, if you took part. One of my favourite places to visit when in London.